Basil! It’s one of my family’s favorite herbs. 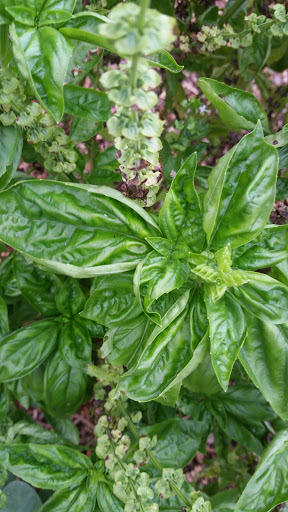 We were blessed with an abundance of basil this year. One of the ways it can be used is in a classic pesto. It’s really simple to make and is a great way to preserve the harvest. In a food processor or blender, blend all ingredients except for the olive oil. When the ingredients are blended, slowly pour in the olive oil and continue to blend until well blended. You will probably need to scrape down the sides a couple of times. Look for a smooth consistency but the thickness is totally up to you. If you prefer a thicker mixture, reduce the olive oil; for a thinner consistency add more olive oil a little at a time. On pasta or gnocchi YUMMM! Pesto freezes wonderfully! I freeze it in ice trays, then move to a ziplock bag. It will keep for months in the freezer.